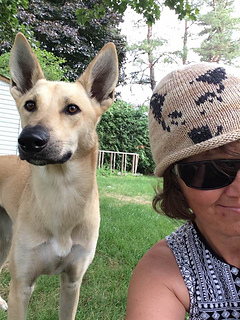 The DINGO MUTS is designed to be a fun hat project providing comfort and warmth in a lightweight fabric. The Dingo Muts showcases Australia’s finest Merino yarn and shows off the Dingo, arguably the ‘Lion King’ of the Australian landscape. The Dingo is now believed to have a very important role in maintaining the balance in Australia’s natural eco-system and with the numbers declining rapidly, 100% of the sales of the Dingo Muts pattern will be donated to help the plight of the Dingo in Australia. The Pattern recommends to use the soft Fair Dinkum yarn in 2 contrasting colours, available via the Dingo Dyeworks website. The word Muts means a knitted hat, in Dutch. It’s what I call the simplest version of a beanie. The type with nothing fancy. The type that hangs by your coat on the coat rack that you reach for to put the bins out. The one you grab to pick up some bread and milk from the shop. The everyday beanie. Made for cosy comfort, the Muts suits every mood and style.